This entry was posted on April 28, 2014 at 10:26 am and is filed under 1980s, Heavy Metal, Music, Rock, Uncategorized with tags Bernie Torme, British, Classic Rock, Future Shock, Gillan, Glory Road, Guitarists, hard rock, Heavy Rock, Ian Gillian, power ballads, progressive rock, The 1980s. You can follow any responses to this entry through the RSS 2.0 feed. You can leave a response, or trackback from your own site. I love all those early 80’s Gillan LP’s. Very underrated I think. I agree with Mr. 1537. Sacre Bleu is such a great song and title! I think Colin Towns was the hidden talent in the band. Colin Towns wasn’t given the credit he deserves here and I agree about Sacre Bleu. I don’t know if you read Gillan’s book. The old Ian Gillan band used to give Colin Towns a really hard time. Gillan came into the studio one day and the band were laughing at him. 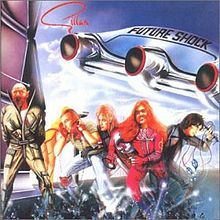 Towns said, “I wrote a song, and it’s about you, and it’s called Fighting Man.” The Gillan band were like, “We don’t want to play that nonsense, we’re into progressive music.” Ian Gillan flat out fired the band and said, “Colin and I are going forward. I’m a rock musician. Enough with your jazz fusion nonsense!” True story. Wow, that is an interesting story. I have to read Gillan’s book, it sounds good. Thanks for enlightening me. It was a great book. Probably out of print now (of course) but there were two printings — one from 93 when he reunited with Purple, and one from 96 when Morse joined, with updated chapters.